â€œA seasoned witch could call you from the depths of your disgraceâ€¦â€. This is bass/vocal counterpoint at its most difficult. Because Yes has always had a lead singer (usually Jon Anderson), Squire has spent his career as a background harmonist. And whether the other harmonist has been Peter Banks, Steve Howe or Trevor Rabin, he has always sounded good, the anchor of the harmony team. He can sing as if he were in a very good choir and thatâ€™s how he began his musical journey, singing in the St. Andrewâ€™s church choir, London, when he was young. His clear voice and ability to sing extremely difficult passages reflects those origins. He was musically inspired by the Beatles (and who wasnâ€™t?) and by Paul McCartney to take up the bass. What was it that made him so good at playing and singing? We can only speculate. We know that we have a bad acid trip to thank for his amazing technique on the bass. He ended up in a hospital and then holed up at his girlfriendâ€™s house wood shedding and developing his unique bass style. By the time he was ready to re-emerge into the world, he was probably able to play extremely well without having to concentrate on it, opening himself up for playing and singing with the best of them. It would appear highly likely that he could already sing at that point and that he was a fan of the vocal groups of the sixties (Simon and Garfunkel, the Byrds, etc). It may be that by the time he re-emerged into the world that he had the singing/playing gift intact. It may be that his endless practicing got him to the point that he was so good at playing that he did not have to concentrate on it. 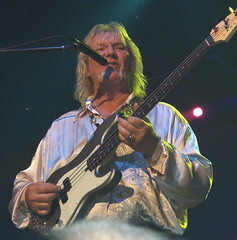 He gained a reputation around London with the group Syn and stepped it up a few notches when Yes formed in 1968. Right from the start, from what we have available to us recording-wise, Squire was incredible at playing hot bass lines while singing beautiful harmonies. Even then he was more than an emerging bass player. He had emerged. Iâ€™ve never heard or read what his techniques are for singing and playing simultaneously but it appears to be a gift that comes naturally to him. I once saw a snippet of him in the studio playing a complicated bass line and singing his harmony part with the appearance that he was working his part out on the spot and it was already spot on. But thatâ€™s how Yes worked, at least in the 1970s. A simple version of a song might be brought in and the group would whip it into something other. The musicians had to be able to respond to changing musical tides and play them well without a lot of time wasted. From comments Iâ€™ve read, Squire feels that he and his cohorts should be able to play about anything at any time. And so they can. How did he become good at playing and singing? I would hazard a guess, but Iâ€™ll bet Iâ€™m right. If you asked Chris Squire what he did to become a great singing/player, heâ€™d respond like most seasoned pros who say that they just did it. They had to do it or they would not have made it. They play in bands so many nights, so many gigs for so long that they just become good at it. In Chris Squireâ€™s case, I think youâ€™ll agree that he became damn good at it. Singing while playing bass is a challenge, albeit a worthwhile one. There is a tendency for those who are new to this art to speed up their bass line when they start singing. The reason for this is that your brain is excited about trying this new venture out and it seems to take a while for the correct neurons to connect properly. Having played been a singing bass player (and closely watched many others, including Paul McCartney, Jack Bruce, Chris Squire and Greg Lake), Iâ€™m excited about being asked to write this article. It covers my thoughts on the subject in as succinct a way as I can put it. If youâ€™re starting out as a bass player, or if youâ€™re switching from another instrument and you want to sing, you have a choice to make. You can either have fun working at becoming good at singing/playing or you can look amateurish standing on stage. If youâ€™re reading this website (and this article) it sounds like youâ€™ve made the right choice. “Here’s a bass player who has decided not to work to become professional”. Hopefully you don’t want people saying this about you. Two vital things about playing bass and singing are, 1) Getting to know every note on the neck of your bass without looking and 2) Learning how to play in rhythm along with a drummer while singing. Following are some exercises you might want to try. Find a song that has a driving bass line and a vocal that you want to sing. One of the first songs I learned to play and sing was the Beatlesâ€™ Hey Bulldog. Later, in the eighties, Addicted To Love was that song for me. Itâ€™s a good one to practice to. If you can master playing and singing that along with a drummer (or the CD), youâ€™ll be able to sing a lot of other songs. Green Day has a lot of songs that are a challenge to play and sing. Find ones that you like, songs that challenge you, and learn how to do them. Practice singing 12-bar blues with a walking bass line while singing. Play heavy and make the bass line walk all over the neck – up and down – not just follow established bass walking patterns. The important thing is not to get stuck only playing in E or A. What if you get in a horn band? Better practice Bb. And best to practice in all keys….every one of them. A great exercise to get to know the neck without looking is to pick a note, any note and then find that note on the neck in four places. Go through every note by fifths (i.e. start with E, B, F#, C#, Ab, Eb, Bb, F, C, G, D, A). Find four notes quickly for each note. If you can’t find one, stop and locate them then start the exercise from that note. Do this without looking at the neck. If you can get a drummer to spend time helping you out, play (while singing) with that drummer for hours on end. Have the drummer listen carefully to your rhythm and if you fall off his/her beat in any way, have them do something to let you know. Back in the day I did this with my drummer brother for hours. It was effective because out of some sort of pride I would not want the guy to let me know I was falling off the beat. That caused me to stay on the beat out of anguish. You may well come up with exercises that work better for you. In the end, the idea is to get to where youâ€™re not thinking of the bass part so much, but of your vocal performance. What youâ€™re singing is what most people catch on to; what youâ€™re playing on bass should be coming naturally if youâ€™ve prepared.